How do I install the Netgear Backup App on my Netgear NAS device? 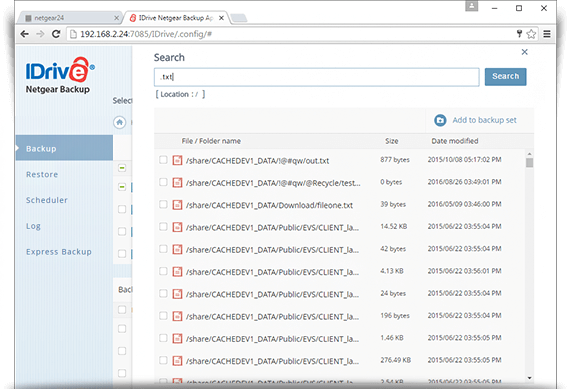 How to launch and use the Netgear Backup App? How can I manually backup/restore data? How can I create a new scheduled backup? How can I edit an existing scheduled job? Is it possible to cancel a Scheduled job? How can I delete a scheduled job? Is it possible to change the default location of my backup jobs? How can I change the location of my restore jobs? How do I stop my scheduled jobs at a particular time? Can I update my backup set content for a job? Can I search for files/folders on my computer, using the Netgear Backup app? Can I search for files/folders in my cloud account, using the Netgear Backup App? My Netgear device is connected to a Proxy Server. 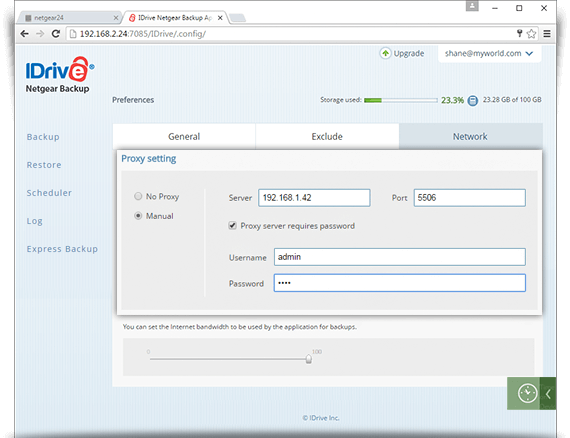 How do I configure the Proxy Server settings on the Netgear Backup App? My backups are failing and log file shows 'Quota over limit' message. How to make sure my backup works fine? When I am logging in to my IDrive account for the first time on a new Netgear machine, it is asking me to select location/computer for backup. Why? 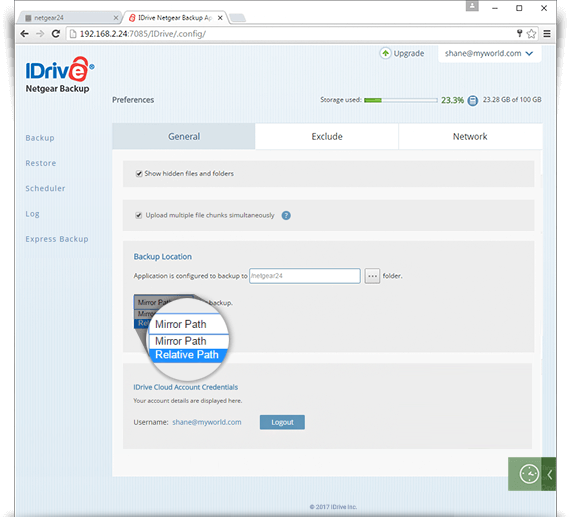 Can I login to another IDrive account while already logged in to the Netgear backup app? The 'Restore files from my local device' section in the 'Restore' tab of my Netgear Backup app displays no data. What should I do? Do I need internet connectivity for backing up data to the Express device? 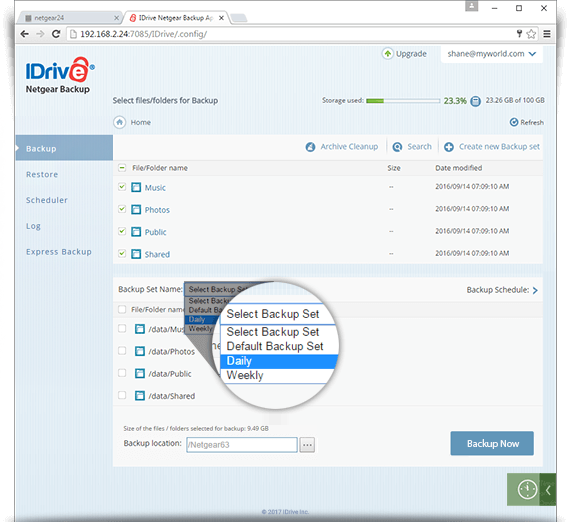 IDrive Netgear Backup app is a simple and secure online backup solution for Netgear Network Attached Storage (NAS) devices. Download and install the Netgear Backup app on your Netgear NAS device, to backup all your data to the cloud. Log in to your Netgear NAS device as 'admin'. Download DEB and save the appropriate installer for your Netgear device. On the 'Netgear Admin' page, select the 'Apps' tab. 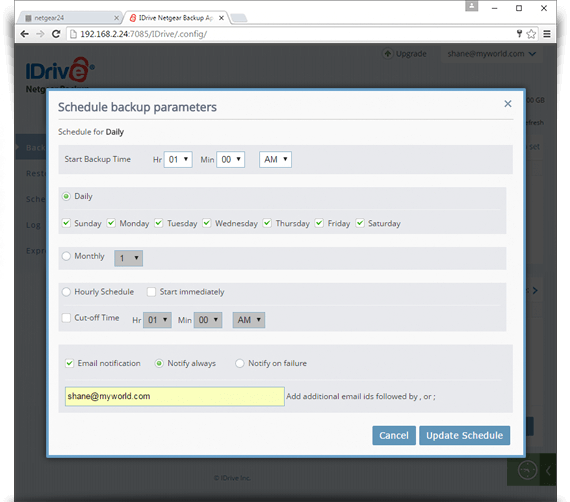 Click 'Browse' and select the IDrive DEB file, and click 'Upload'. Click 'Refresh'. The IDrive Netgear Backup app will be visible under the 'Installed Apps' tab. Click 'Launch' under to launch the app. Log in to the NAS device with your Username and Password. On the 'Admin' page, click 'Apps' > 'Installed Apps' and click 'Launch' under to launch the app. You will be redirected to the 'IDrive Netgear Backup' login page. Enter your NAS device credentials and click 'Login'. 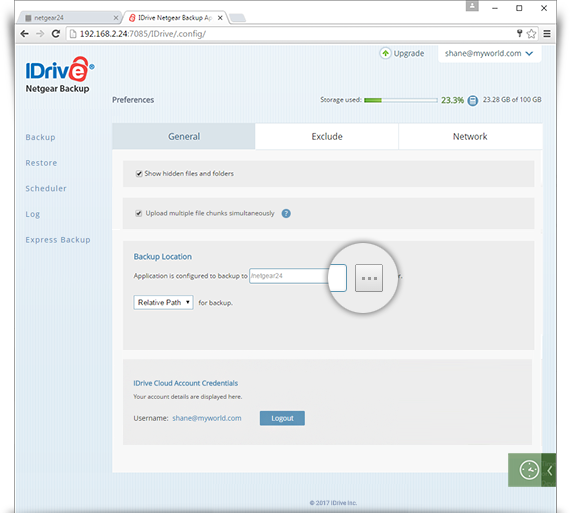 Enter your IDrive Username and Password and click 'Login'. Note: If you had set a private encryption key for your account, on clicking 'Login', it will redirect to the 'Encryption Key' page. Enter your encryption key and click 'Continue'. 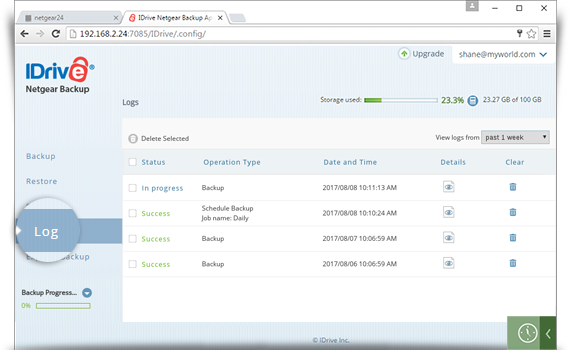 Express Backup: Enables you to backup data from the Netgear device to the IDrive Express device. Click the 'Backup'/'Restore' tab and select the file(s)/folder(s) you wish to backup/restore manually. Click next to backup/restore location to specify a different backup/restore location. You can exclude individual files/folders (for e.g. file extension like tmp), which may be part of the backup set, from being backed up to your account. From the 'Select files/folders for Backup' list, click the drop-down arrow against the respective file/folder and click 'Add to Exclude List'. Click the 'Backup' tab, and click 'Create new backup set'. Note: You can create maximum of five backup sets. Yes, you can cancel an ongoing scheduled job. Log in to the Netgear Backup App, click the username on the top-right corner, and then click 'Preferences'. Select the new backup location on your account. Log in to the Netgear Backup App, click the 'Restore' tab. 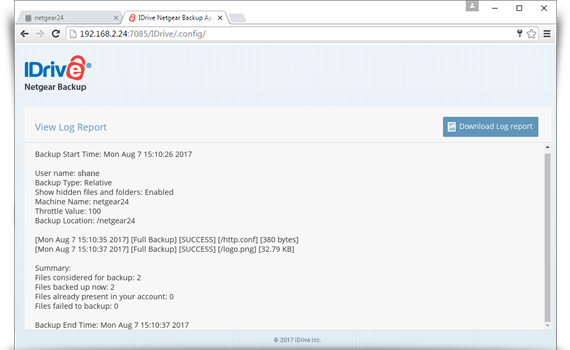 The 'Mirror Path Backup' option replicates the file/directory hierarchy present on the Netgear system to your IDrive account. By default, the 'Mirror Path' option is enabled. 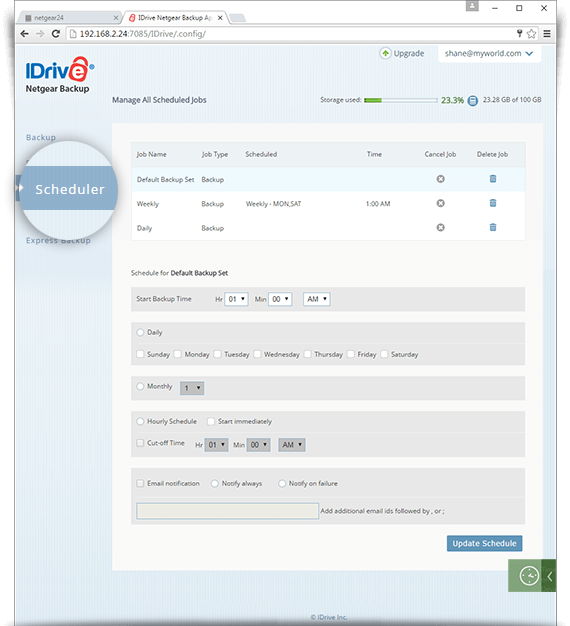 For example, if you select to backup the file 'bin' from 'root/opt/bin' with mirroring option selected, then IDrive will maintain the same directory structure in your online IDrive account as 'ShanePC/root/opt/bin'. 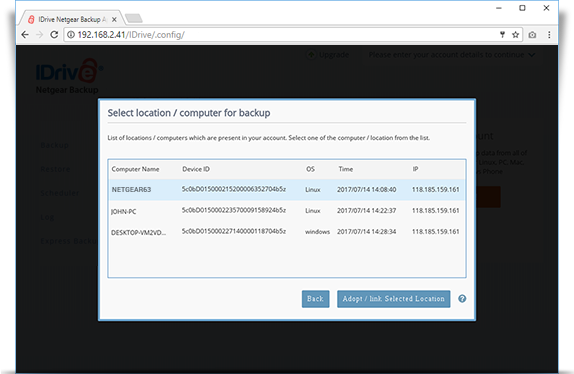 The 'Relative Path Backup' option will not replicate the directory hierarchy of the file as it exists on your Netgear system, but instead it would just backup the file to the selected folder on your IDrive account. 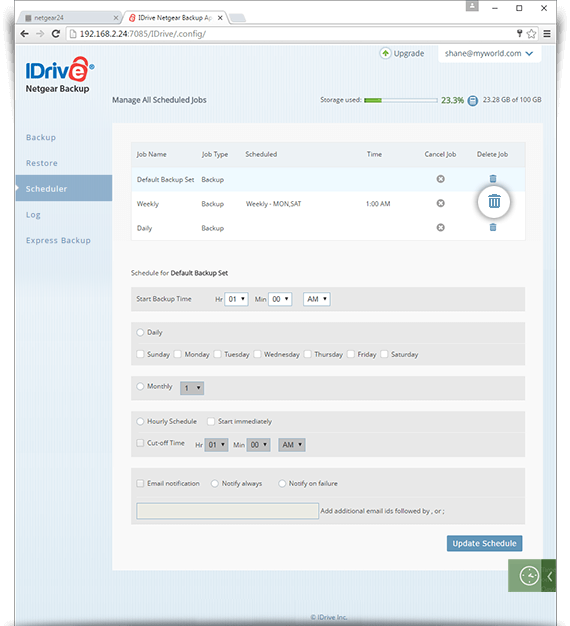 For example, if you select to backup the file 'bin' from 'root/opt/bin' with the 'Relative Path' option selected, IDrive will maintain the directory structure in your online IDrive account as 'ShanePC/bin'. Click the 'Exclude' tab and then click next to 'Exclude files/folders with full path names'. 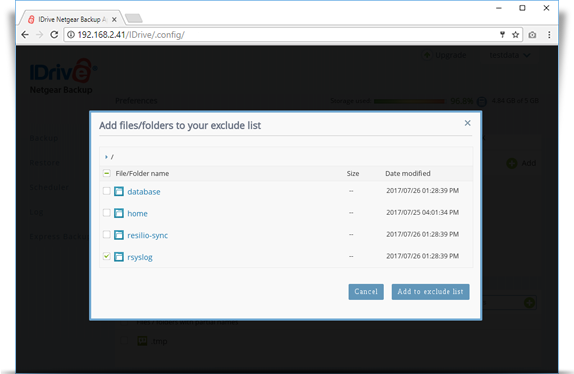 The 'Add files/folders to your exclude list' window appears. Yes, you can update the backup set for an existing job. The selected file(s)/folder(s) will be added to that existing backup. If you have already created five backup sets you will not be able to create any more new backup sets. In order to add a new backup set, you will have to delete any of the existing sets. Yes, you can search for files/folders on your computer using Netgear Backup App. Click 'Search' under the 'Backup' tab. The Search screen appears. Enter the full or partial file/folder name in the 'Search' field. The Netgear local search is case sensitive. Click 'Search'. Files/folders matching the search criteria appear. 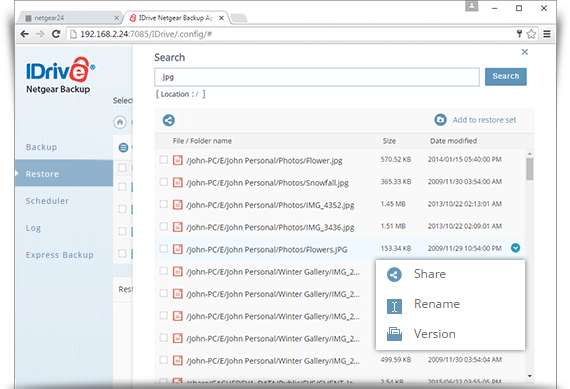 Note: You can use the 'Search' feature to exclude individual files/folders (for e.g. file extension like tmp), which may be part of the backup set, from being backed up to your account. Just search for the files and folders, and from the search results that appear, click the drop-down arrow against the respective file/folder and click 'Add to Exclude List'. Yes, you can search for files/folders in your cloud account. Under the 'Restore' tab, click 'Search'. The Search screen appears. Click 'Search'. Backed up files/folders matching the search criteria appear. From the search results, you can share files and folders, rename them, add them to the restore set, and view their details. Note: For some accounts, certain functions like new folder/create new restore set/rename will not be available, and drop-down list to select the bucket will be available. Log in to the Netgear Backup App and click the 'Log' tab. 'Failure' indicates majority of files were not backed up/restored. Note: Click the 'Scheduler' tab to check the status of your scheduled jobs. Log in to the Netgear Backup App and click . If your Netgear Device is connected to the internet through a Proxy Server, you can configure the Proxy Server settings on the Netgear Backup App. Archive Cleanup does a one-to-one match of the local data in the backup set selected for cleanup with your account files, and permanently deletes data from your account that no longer exists on your NAS device. This frees up space in your IDrive account. Select the required percentage for cleanup, and click 'Cleanup Now'. 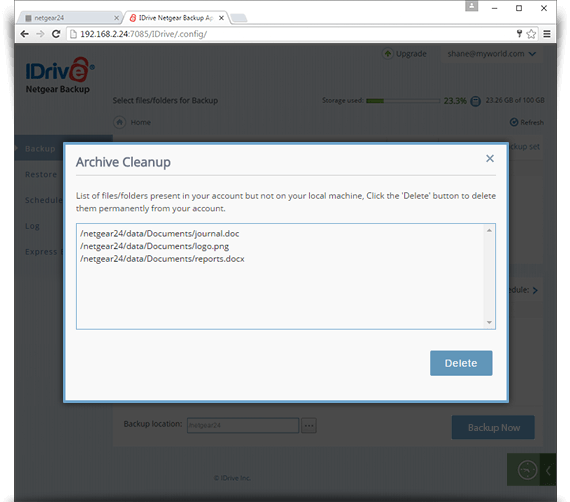 IDrive will generate a list of items to be deleted from your account. If you want to delete all the files mentioned in the list, click 'Delete'. On the ‘Backup’ tab, select the backup set for which you want to run the cleanup operation. Click ‘Archive Cleanup’. The Archive Cleanup window appears. 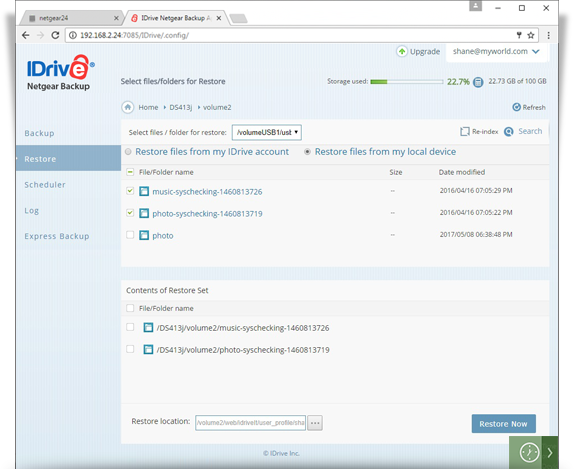 Yes, currently IDrive retains up to 30 previous versions of all the backed up files and for accounts created prior to 11-07-2018 up to 10 versions can be retrieved. Click on the icon that appears on the right side of the list. Log in to the Netgear Backup App. 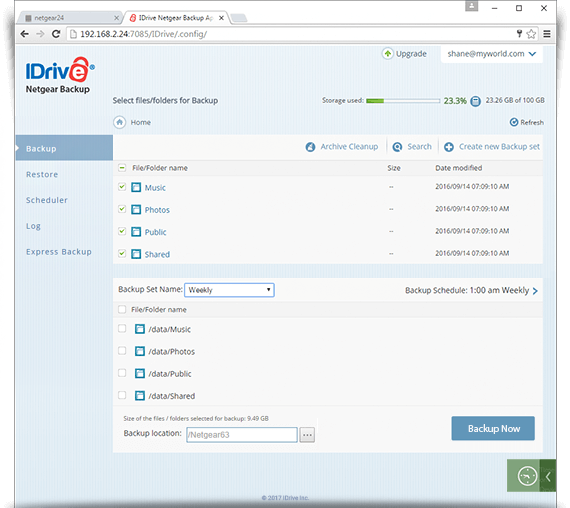 IDrive allows you to restore your previous computer's backup archive on your new computer. You can select the 'Adopt/Link to an existing location/computer' option for this. After logging in, reconnect to the previous computer's backup archive in case you are replacing an old computer. By adopting the previous computer's backup archive, you can avoid time consuming initial backup of your files. Install Netgear backup app in your NAS machine and log in to Netgear Backup App. 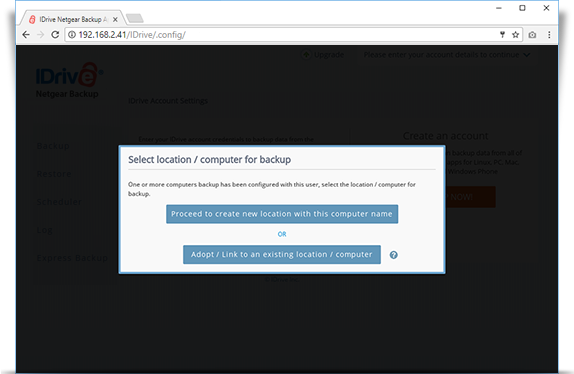 In case you do not wish to adopt your previous backups on the new machine, you can click 'Proceed to create new location with this computer name' when prompted to select location/computer for backup. Enter the other account credentials and click 'Login'. If you have enabled the 'Upload multiple file chunks simultaneously' option under 'Preferences' tab, the backups or restores will consume a little bit more machine resources. This option speeds up data transfer by using multiple thread concept. You can disable this option if your machine resource utilizations are higher than expected. All files backed up to the Express device appear under the ‘Restore files from my local device’ section in the ‘Restore’ tab. In case no data is displayed, you can run the 'Re-index' operation. This will re-generate the file/folder list with all the backed up data. Note: While Re-index is in progress, you will not be able to perform any local restore/express backup operations. You can perform Express backup without an active internet connection. However you would need internet connectivity to login to the IDrive application. Once you are logged in, you can run the backup even if your machine is not connected to the internet.